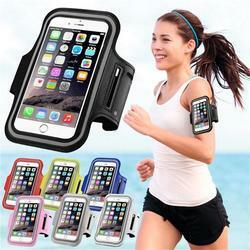 Home › Mobile Phone Accessories › Armbands › LYBALL Armband Wrist .. This sport armband is specially designed for ≤6.2 inch screen smartphones, which is designed by PU leather, featuring four earphone jacks and additional storage pocket, playing an imporent role in sports. Environmental PU material makes it durable and harmless to your life. Fashion and ultra thin design make it portable and practical strong. Four earphone jacks design is more suitable for your different phone and listening to music is more enjoyable when running. Additional storage pocket to accommodate small keys. Double buckle can flexibly adjust the degree of tightness to meet different sizes of the arm. Eleven young colors to stand out your personalization and enrich your life. China Post Ordinary Small Packet Plus, Tracking information only in China, delivery time: 15-60 days(Brazil: 15-90 days). China Post Air Mail / Singapore Post / Hongkong Post , delivery time : 15 - 60 days(Brazil: 15-90 days). ePacket / e-EMS/ EMS, Delivery time: 7 - 20 days. DHL, Delivery time: 3 - 10 days. Full refund if your order doesn't arrive within the delivery time promised. Full refund and keep the product, if your item is significantly different from our description. Please leave positive feedback and 5 stars, if you're satisfied with our items and service. If you have any problem with the product or our service, please contact us before you leave a negative feedback. We will provide you the best after-sale service. You can click the Chat Now button to chat with us. If we're offline, you can leave a message to us and we will reply you in 24 hours.